Home TechBuzz Windows 10 & Secure Boot: Is Linux Really Doomed? Back in 2011, many Linux fans were furious at the prospect that machines capable of running Windows 8 might lock them out of the ability to install Linux distributions on their own computers. The discussion was spurred by the fact that the BIOS firmware on motherboards would require UEFI compatibility for every system installed on the machine. 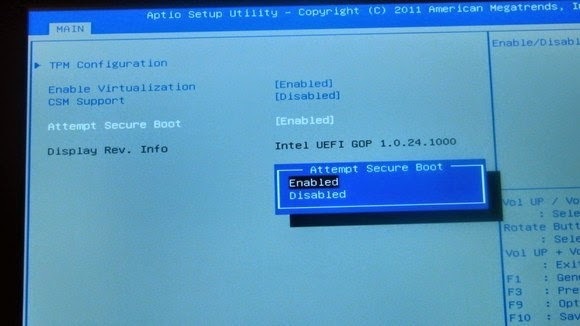 As a resolution, Microsoft mandated that manufacturers give users an “off switch” for UEFI Secure Boot. Fast forward to 2015, and the rage began once again when Microsoft announced that Windows 10 will not require manufacturers to include an option to turn off UEFI. What does this mean? Is Linux being phased out by design? As I’ve said above, Linux users are understandably concerned about Windows 10’s eventual prospect. Until 2015, manufacturers of BIOS chips and motherboards were required to allow users to turn off UEFI checking so that they can run Linux on their machines without any disturbance. The release of Windows 10 tells a different story, one that causes concern to many that they may not be able to install their favorite operating systems on computers that they build or pay for. Of course, to understand this dilemma more, you have to know what the “Unified Extensible Firmware Interface” does. In short, it checks the digital signature on the operating system’s loader and drivers to make sure that some low-level malware isn’t being injected into it, damaging your hardware. In theory, UEFI could be locked down to approve only Microsoft-signed software, making it impossible to run anything not made by the company. Can Windows 10 Run On a Pre-UEFI-Era Computer? The answer is “yes”. Windows 10 is able to load on both UEFI and non-UEFI systems. This gets me to the next point: If you build your own computer, the manufacturer of the motherboard has every incentive to allow you the option to install Linux, since Windows 10 will be able to run on hardware that has UEFI booting disabled. This may not be very true for manufacturers of computers that have specific partnerships with Microsoft, but we’re only able to speculate on this. No. UEFI is a global standard that Microsoft has no ownership over. Therefore, if Linux distributions include compatibility for UEFI, they’ll be able to run without a problem in a “secure boot” environment. Technically, this means that they aren’t “locked out”, per se. Linux Mint 17 has had no problems installing with UEFI enabled, for example. The future may look bleak, but developers will always have the incentive to make their product as compatible with as many machines as possible. That includes developers of open-source operating systems like Linux and its various distributions. As for manufacturers, it may be safe to assume that many of them will include an “off switch” for UEFI even though they are no longer forced to. There are no hurdles preventing them from doing such a thing.